The symptoms of brain cancer look an awful lot like other everyday ailments, from headaches to depression. Here’s when to consider seeing your doctor for a workup. The good news is that brain cancer affects less than 1 percent of the world’s population; the bad news is that brain tumors are often accompanied by very few symptoms, and brain tumor symptoms disguise themselves as everyday ailments such as headaches and exhaustion. Read on for eight silent but serious brain tumor symptoms, and how you should know whether or not to see a doctor. It can be very difficult for even doctors to tell the difference between headaches (or full-on migraines) caused by brain tumors and those resulting from other reasons. “The best indicator is a new daily headache that won’t seem to go away,” says Mike Chen, MD, PhD, associate professor in the division of neurosurgery, department of surgery, at City of Hope in California. “These headaches tend to get worse over time and are often present when you wake up in the morning, when intracranial pressure is high from lying in bed for . . . long periods of time.” This pain can vary greatly regardless of the size or growth rate of the tumor. “A small, fast-growing tumor can cause as severe of a headache as a large, slow-growing tumor,” says Santosh Kesari, MD, PhD, neuro-oncologist and chair of the department of translational neuro-oncology and neurotherapeutics at John Wayne Cancer Institute in Santa Monica, California. And there’s no specific type of headache that can predict whether or not a person has a brain tumor. The key is to be on the lookout for new, persistent headaches that do not respond to any treatments, such as over-the-counter medicines. Find out the 15 subtle signs of cancer that women are likely to ignore. Patients experiencing this particular brain tumor symptom may not be aware of it at all—let alone associate it with a brain tumor. They may not even notice an alteration in their vision quality until they continually bump into things on one side of the body related to the vision loss or have repeated car accidents on the side of the loss. “This particular symptom of impaired peripheral vision is known as bitemporal hemianopsia,” says Christopher Carrubba, MD, co-director for medical education at Med School Tutors. “We often see this symptom with pituitary tumors that compress the optic chiasm, or part of the visual pathway.” Read about the other surprising diseases eye doctors can diagnose first. The motor cortex of the brain initiates and controls muscle movement throughout the body. “The right motor cortex controls the left side of your body and the left motor cortex controls the right side of your body,” says Dr. Chen. If there are tumors anywhere along this pathway, these signals are completely disrupted and the result is loss of function.” If you have a brain tumor, you may not experience pain in your limbs, but your left or right leg or arm may not respond the way you’re used to—or at all. Weak legs may also mean that you have a vitamin D deficiency. Don’t miss these 13 subtle signs of cancer that men are likely to ignore. Another of the common brain tumor symptoms is slurred or stuttering speech. “Language problems such as stuttering, difficulty naming objects or understanding what others are saying are key symptoms of a tumor in the frontal or temporal lobes, areas of the brain associated with motor function of speech and language comprehension,” says Dr. Carrubba. “There are two speech centers in the brain that are located on the left side: Wernicke’s area, which allows us to understand and comprehend speech, and Broca’s area, which activates the muscles that create sound.” When a tumor is present in the brain, both abilities are often obstructed. 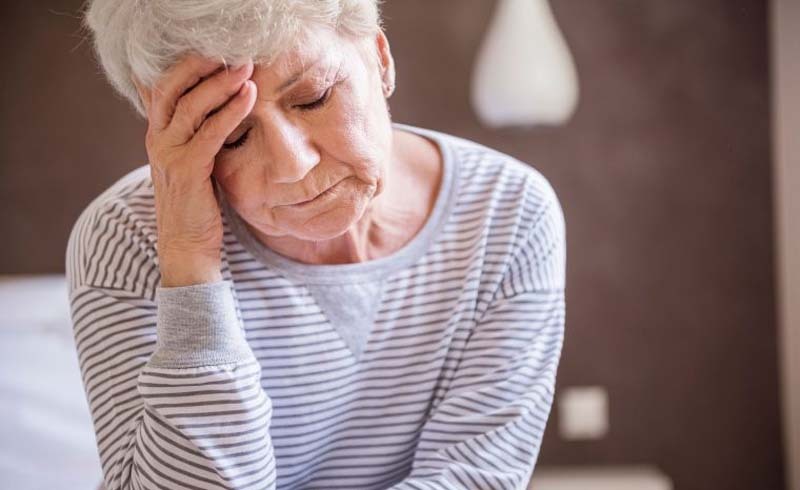 “Patients suffering from a brain tumor may develop depression, anger or anxiety, even if they don’t commonly exhibit these types of emotions,” says Sumeet Vadera, MD, neurosurgeon at the University of California, Irvine. “This is related to tumor irritation or compression of portions of the frontal lobe, which is responsible for many of our personality traits.” Patients may also experience changes in behavior, including becoming more angry or agitated, meddling in more risky behaviors, acting overtly sexual, or showing loss of inhibition. “A large, slowly growing tumor in the frontal lobe can even alter personality and judgment so far as to be mistaken for criminal behavior or psychiatric problems,” says Dr. Chen. The temporal lobe, located in the bottom middle part of the cortex behind the temples, is responsible for processing your ability to hear sounds, as well as your ability to comprehend and understand language and conversation. “If you’re experiencing hearing loss from one side or a constant ringing sensation, known as tinnitus, you’ll want to make an appointment with your doctor, who can determine whether your symptoms are severe enough to see a neurologist,” says Dr. Carrubba. Find out exactly what the ringing in your ears is trying to tell you. The brain pretty much controls nearly everything in our bodies, including our production of hormones. “It does this by means of an extension known as the pituitary gland, a pea-sized structure located at the base of the brain,” says Dr. Chen. “Tumors affecting the pituitary gland can secrete high amounts of hormones or prevent the normal gland from working.” This is why many women suffering from a brain tumor are unable to conceive or produce milk after giving birth. One of the many areas where the brain stem plays a vital role is with motor function. If you start to find walking difficult, especially in the dark, and you tend to lean toward one side, this could be one of the brain tumor symptoms caused by tumors in the cerebellum, the area of the brain responsible for balance and coordination. Now, learn the truth about these 50 cancer myths you need to stop believing.